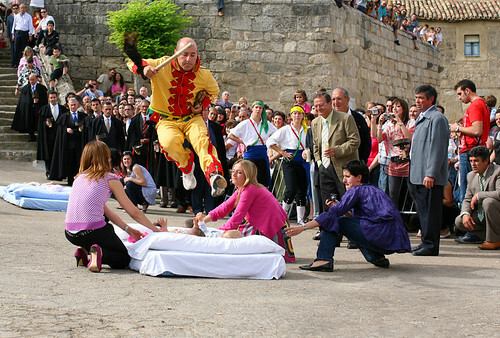 The World is full of many odd traditions, however the festival of "Baby Jumping" in the small village of Castrillo de Murcia near Burgos, Spain is perhaps one of the most strangest. The tradition known as El Salto del Colacho (the devil's jump) or simply El Colacho, dates back to circa 1621. It takes place every year after the feast of Corpus Christi. The festival is held for four days after the feast of Corpus Christi. El Colacho (devil) in yellow/red costume and wearing a mask roams the street to the beating of drums. He also carries a castanet and a stick having a hanging ponytail at one end and playfully chases young children. The baby jumping is performed on the final day when agile men representing the devil (El Colacho) jump over the babies, born during the preceding year, who lie on mattresses in the street. It is believed that devil's jump takes away the evil, cleansing the babies of original sin, ensure them safe passage through life and guards against illness and evil spirits. Though the Catholic Church frowns over this ritual yet it is continued to be performed every year. As per Daily Mail "Over the centuries there have been no reports of injuries among the babies, but the festival is still considered to be one of the riskiest in the world." View location in Google Earth / Google Maps. (Unfortunately in low resolution).